Msvcp100.dll errors happen when the msvcp100 DLL file is deleted or corrupted in some way. Sometimes, msvcp100.dll errors can indicate a problem with the Windows registry, a virus or malware issue, or even a hardware failure. This application failed to start because msvcp100.dll was not found. Re-installing the application may fix this problem. The file msvcp100.dll is missing. Cannot start [APPLICATION]. A required component is missing: msvcp100.dll. Please install [APPLICATION] again. You might run into a msvcp100.dll error message when Windows is first starting up or even when it's shutting down, while a particular program is being installed or used, or maybe even during a new Windows installation. No matter when the DLL error is shown, it's an important step in troubleshooting to identify that time - to see when exactly the msvcp100.dll error is happening. Knowing the context is a huge part of identifying how to fix the problem. The msvcp100.dll error message might happen on any of Microsoft's operating systems - Windows 10, Windows 8, Windows 7, Windows Vista, Windows XP, or Windows 2000, and may apply to any program that uses the msvcp100.dll file directly or relies on it in some way. You should only download msvcp100.dll from a trusted, verified source that has a clean, unaltered copy of the DLL file. Never download msvcp100.dll from a "DLL download" website - there are many reasons why downloading a DLL file is a bad idea. If Windows won't load because of problems with the msvcp100.dll file, start Windows in Safe Mode before you follow these steps. Download the Microsoft Visual C++ 2010 Service Pack 1 Redistributable Package MFC Security Update and run it. This will replace/restore the msvcp100.dll with the most recent copy provided by Microsoft. You're given several download options from Microsoft for this update, based on the version of Windows you have installed - x86 (32-bit) or x64 (64-bit). See Am I Running a 32-bit or 64-bit Version of Windows? for help, if you're not sure what to choose. Try your best to complete this step before any of the steps below. Applying this update is almost always the solution to msvcp100.dll errors. Install any available Windows updates. Though the standalone installation in the previous step should take care of this, it's possible that a service pack or patch installed by Windows Update may also replace or update the msvcp100.dll file that's causing the errors. Restore msvcp100.dll from the Recycle Bin. The simplest cause of a "missing" msvcp100.dll file is that you've accidentally deleted it and it's gone into the Recycle Bin. If the DLL file isn't in the right folder, then programs that rely on it can't use it, and so the error is shown. If you think you may have inadvertently deleted msvcp100.dll, but it's not in the Recycle Bin, it's possible you've already emptied it. You might be able to recover msvcp100.dll with a free file recovery program. You may have deleted msvcp100.dll because it wasn't working right or because it was infected with malicious computer code. Be sure the file you restore was working properly prior to deleting it before you attempt to recover it. Run a virus/malware scan of your entire system. It's possible that your specific msvcp100.dll errors are caused by a virus or other malware infection that resulted in the DLL file become unusable. Use System Restore to undo recent system changes. Using System Restore to revert important system files to a previous version should fix msvcp100.dll errors that are caused by changes to these types of system files. Reinstall the program that's producing the msvcp100.dll error. 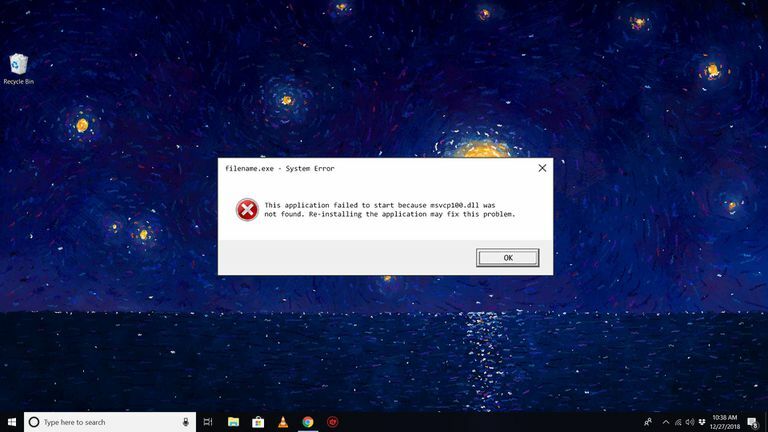 If you see the msvcp100.dll error when you're first opening a particular program, or while you're using that software, then the error is most likely being caused by that application, in which case reinstalling it should help. Every program that uses a msvcp100.dll file is using the copy that's stored in either the C:\Windows\System32\ or C:\Windows\SysWOW64\ folder. As long as those folders contain a clean copy of the DLL file, then the program you reinstall should end up using the same file. Repair your installation of Windows. If the individual msvcp100.dll file troubleshooting advice above isn't proving to be helpful in eliminating the DLL errors, performing a startup repair or repair installation should restore all Windows DLL files to their working versions. Test your memory and then test your hard drive. Your computer's memory and hard drive are really easy to test for problems, and they might just be related to the msvcp100.dll errors. Note: If these hardware tests fail, even if they don't fix the msvcp100.dll problems, you should most likely replace the memory or replace the hard drive as soon as possible. Use a free registry cleaner to repair any issues in the registry that might be caused by the msvcp100.dll file. This is usually accomplished by having the application delete invalid msvcp100.dll registry entries that might be causing the DLL error. we've included this option only as a last non-destructive attempt at fixing the DLL error before moving on to the next step — we rarely recommend the use of registry cleaners. Perform a clean installation of Windows to delete everything from the hard drive and then install a new, hopefully, error-free copy of Windows with fresh DLL files. If none of the steps above correct the msvcp100.dll error, this should be your next course of action. All the information on your hard drive will be erased during a clean install. Make sure you've made the best attempt possible to fix the msvcp100.dll error using a troubleshooting step prior to this one. You may need to repeat Step 1 after installing a fresh copy of Windows if the msvcp100.dll problem persists past this step. Troubleshoot for a hardware problem if the software-related steps from above still haven't resolved the msvcp100.dll errors. After a clean install of Windows, the DLL problem can only be hardware related.